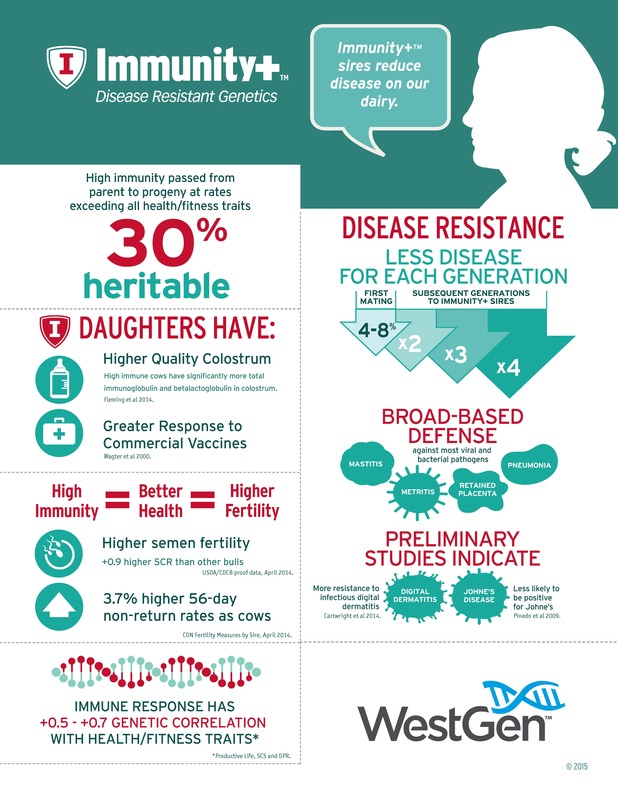 High Immune Response technology is a patented technology that is unique to Semex. Use Immunity+® Sires to produce cows that have less disease and provide additional benefits which improve overall herd health and increased longevity. High immune cows have significantly more total immunoglobulin and betalactoglobulin in colostrum. Semex Immunity+™ is making an impact at Schwab Dairy in New York and worldwide. Q: WHY IS SELECTING FOR IMMUNITY IMPORTANT? Disease frequency in the global dairy population has been increasing each year since 1996. Selection of traits with low heritability that do not directly measure an animal’s ability to resist diseases has not provided a significant change in health of the dairy population. Q: HOW CAN IMMUNITY+HELP SOLVE THIS PROBLEM? Immunity+ sired animals have genetics which have been proven to provide robust immune systems capable of dealing with a large variety of potential immune challenges, both viral and bacterial in nature, encompassing nearly all major diseases that have an economic impact on farm. Q: WHY IMMUNITY+ INSTEAD OF SELECTING DIRECTLY AGAINST INDIVIDUAL DISEASES? 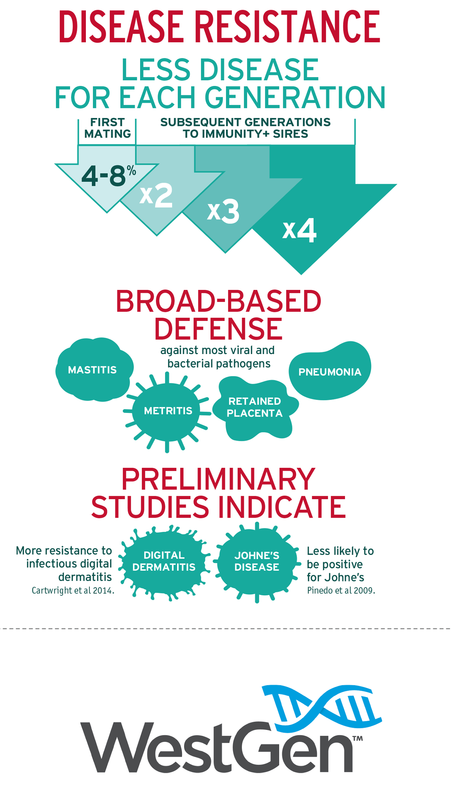 The immune system is hugely complex, and selecting for one disease like mastitis can leave animals more susceptible to other potential diseases such as Johne’s or viral pneumonia. Immunity+ provides a robust resistance to all disease, plus the heritability is significantly higher than any individual disease incidence. Q: WHAT IS HERITABILITY AND WHY DOES IT MATTER? Heritability is the proportion of total variance in a trait that can be explained by genetics. This means that traits with low heritability are more difficult to make genetic progress in relation to the total amount of variation in the population. High heritability traits are usually easily and directly measured, and genetics have a larger impact on the difference observed between animals. Q: ARE THERE ANY BENEFITS OTHER THAN LESS DISEASE? Immunity+ sired animals also respond better to commercial vaccinations and produce higher quality colostrum than animals sired by any other bull. Q: HOW MUCH REDUCTION IN DISEASE CAN I EXPECT FROM SELECTING AN IMMUNITY+ SIRE? It varies by trait, but selecting Immunity+ sires should lead to anywhere from 5-10% reduction in disease in just one generation. More generations of selection will continue to decrease disease frequency even further. Q: WHAT DO I HAVE TO GIVE UP TO SELECT FOR IMMUNITY? Nothing! Immunity+ bulls on average have higher genetic merit for all other major traits than the rest of the bulls. No matter what you usually select for, there is an Immunity+ bull that fits your herd. Q: IF IMMUNITY+ IS BETTER IN BULLS THAT HAVE HIGHER GENETIC MERIT, CAN’T I JUST SELECT HIGH GENETIC MERIT BULLS AND ASSUME I’M GETTING IMMUNITY+ TOO? No, there are always exceptions, and the only way to be sure you are getting high immune responding daughters is to select Immunity+ sires. Although Immunity+ sires are high genetic merit sires, not all high genetic merit sires for other traits have genes that will provide the robust, effective response to disease that comes from Immunity+ sires. Q: HAS THIS DATA BEEN VALIDATED IN A REAL COMMERCIAL SETTING? Yes, we have taken data from over 35 large commercial herds, and analyzed data from over 30,000 cows and 75,000 heifers. The results have been astonishing. Reductions in every major disease have been seen, and range anywhere from 5 to 20% reduction in animals sired by Immunity+ sires compared to all others. Mastitis, lameness and mortality saw especially large decreases in frequency. Cows sired by Immunity+ sires had, on average, higher colostrum quality. A correlation of immune response status of their sire and colostrum quality of +0.55 was observed. More importantly, was that no HIR sires had daughters who had average colostrum quality below the 22% threshold recommended for use, compared to 27% of herd average sires having daughters whose colostrum, on average, was too poor to feed to their calves.